Besides the football references in the film, there are a couple of other points worth recording. On Cherry Street was the Anchor Brewery, next door to Arnold Laver. At one time a local chimney sweep devised an apparatus for taking the sawdust from Lavers and using it as a fuel source at the brewery.. I recall that during the 1970s SUFC had their club shop on John Street in a corner shop sized location. 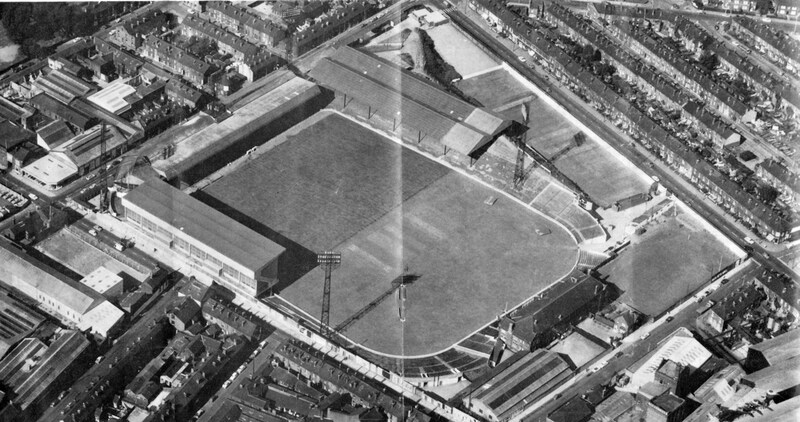 I note that the ground had five floodlight pylons, one mounted on the John Street Stand roof. It can be seen on the picture, look for the long shadow. My grandmother used to work at a fish and chip shop on Hill Street. On match days, she used to open up her front room next door as an impromptu dining room for match goers. She made the best fish and chips at home! Unfortunately, because they lived next door, the family could always smell the remains of fresh fish which put my mother off fish for the rest of her life!